Continuing our journey on growing pineapples at home, we show you how Part 2 of easy it is to grow pineapple plants in containers. We go over the process of showing you the mother pineapple plant as well as a different pineapple variety. We also show you how to cut a pineapple in this video. Enjoy this episode on growing pineapples. This video is a complete growing guide for pineapples. We look at growing pineapples in pots or containers, we also look at how to care for your pineapple plant, pineapple plant care, etc. Grocery Store bought pineapples can be easily grown into pineapple plants by using their tops or crowns. Here is the best fruit fertilizer for pineapples and all other plants. Growing fruits like pineapples in containers is easy provided you know how to care for your pineapple plants. Fruit trees like pineapples grow very well in containers. So sit back and enjoy this journey of growing pineapples in your garden. Its a joy to grow your own pineapples in your garden. Gardening & growing pineapples from crowns or growing these fruit trees in containers is extremely simple as you will see. The pineapple plant has shallow roots and hence you can easily grow it in containers. 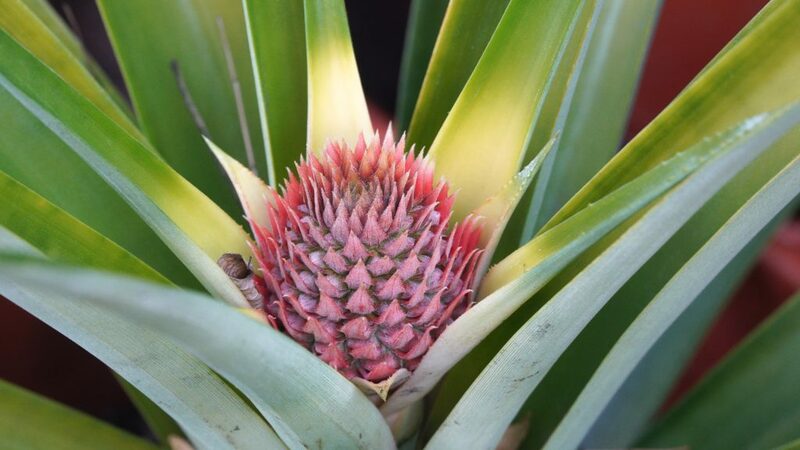 Gardening always involves growing exotic fruit trees and pineapples are no exception! The crowns of the pineapple can be easily cultivated and grown into a full plant. We also show you a pineapple harvest!We then cut a pineapple and how you how the yellow, fruit, delicious pineapple can be easily cut and eaten. ← California Garden – December Garden Tour – Gardening Tips, Harvests & More!